Before a golden ribbon poised across an entire city block in the heart of the San Fernando Valley, 5,000 Scientologists and guests convened Sunday, March 19, to celebrate a monumental achievement: the opening of the region’s new Church of Scientology, the largest in North America. 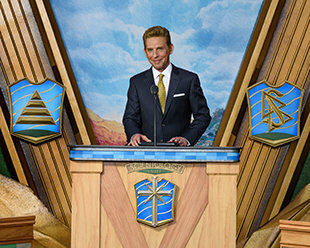 Mr. David Miscavige, Chairman of the Board Religious Technology Center, presides over a high-spirited inauguration ceremony, Sunday, March 19. The audience rose to their feet in resounding ovation after ovation throughout his dedication address. Mr. Miscavige addresses the thousands in attendance during the grand inauguration ceremony held on Burbank Boulevard in the heart of North Hollywood. At 95,000 square-feet set on four acres, the Valley Church is a most expansive addition to Scientology’s expanding universe of Ideal Churches, now numbering 19 in the Western United States alone and 57 internationally. Joined by Scientologists who spearheaded the efforts to bring this new Valley Church to life, Mr. Miscavige officially dedicates the region’s breathtaking Church of Scientology. The crowd of 5,000 Scientologists and guests erupts in cheers, as a massive new 95,000 square-foot Scientology Church is unveiled for the Valley. On a perfect Southern California day, thousands of Scientologists gather to witness the historic moment when the Valley’s striking new home opens her doors. With a burst of confetti and a chorus of applause ringing along Burbank Boulevard, the Church of Scientology Valley sheds her ribbon launching an epic new season of expansion for the Scientology religion. The grand opening commences with a medley of classic film scores evoking the charm of the film industry for which the region has become famous. Performers rapidly segue into a “V for Valley” anthem written and scored for the occasion, bringing the 5,000 in attendance to their feet in jubilant celebration. Mr. David Miscavige with (left to right): Bishop Franklin Harris, Executive Member of the Los Angeles County Clergy Council; Deputy Chief Trevor Richmond, Los Angeles Fire Department, Valley Bureau; Deputy Chief Robert Green, Los Angeles Police Department, Valley Bureau; and Ms. Nellie Barrientos, Los Angeles Education Program Director. Once the ribbon falls, thousands pour through her doors, getting a first, awe-inspiring look at the new Valley Church where they will advance through Scientology services. The excitement was electric as the thousands in attendance received their own up-close view of the newest Church of Scientology. The new Church stands adjacent to North Hollywood’s bustling junction where Burbank and Lankershim Boulevards intersect with Tujunga Avenue and some 60,000 cars pass by every day. The facility spans 95,000 square-feet upon four acres, just blocks from the NoHo Arts District and is poised to engage community change makers across the region. RECEPTION Open seven days a week, morning to night, the Church of Scientology of the Valley Reception welcomes anyone wishing to obtain an introduction to Dianetics and Scientology. SCIENTOLOGY PUBLIC INFORMATION CENTERThe Public Information Center offers some 500 films, providing a complete introduction to every aspect of Dianetics and Scientology. It includes the beliefs and practices of the religion, a biographical presentation on the life and legacy of Founder, L. Ron Hubbard, as well as the many humanitarian initiatives and community outreach programs the Church supports. INTRODUCTORY SERVICES The Church of Scientology Valley provides for the delivery of all Introductory Services. These include an entire array of Scientology Life Improvement Courses to help better any aspect of one’s life. DIANETICS & SCIENTOLOGY BOOKSTORE The Church of Scientology Valley Bookstore makes available L. Ron Hubbard’s works on Dianetics and Scientology. In all, Mr. Hubbard’s legacy comprises tens of millions of published words in dozens of books and thousands of recorded lectures. A Materials Guide Chart provides an informational overview of every book and lecture series and the subjects contained within each. Materials are available in 50 languages. THE PURIFICATION CENTER Scientology Founder L. Ron Hubbard developed the Purification Program to free individuals from the mental and spiritual damage caused by drugs and toxins, through a regimen of exercise, sauna and nutrition—all of which are provided for in our Purification Center. The mural pays tribute to the San Fernando Valley’s heritage and ever-expanding cultural impact as a media and entertainment epicenter. Each one of the thirty-three auditing rooms is ideally appointed to provide the calm, distraction-free setting requisite to achieving spiritual enlightenment. THE ACADEMY The Academy is where Scientologists train to become auditors (spiritual counselors), capable of applying the technology of auditing to help others attain spiritual freedom. The Valley Academy comprises multiple course rooms, each devoted to a different aspect of training. The Café The Café welcomes visitors touring the Church and provides a gathering place for those attending the many scheduled events. It is further provided for parishioners during breaks in their Scientology services. THE CHAPEL The Chapel, lined with the Codes and Creed of the Church of Scientology, seats more than 1,000 and provides for all congregational ceremonies and services—including Sunday Services, Weddings and Naming Ceremonies. The Chapel also serves as an ideal venue for workshops, banquets and events. Massive new Scientology Church sheds her ribbon to launch an epic season of expansion for the religion. Head north over the rise from Hollywood, cross Mulholland Drive, and behold a Valley dotted with swimming pools, lemon trees and stretching for all the eye to see. At 260 square miles, the San Fernando Valley is home to 1.8 million residents, the world’s most prominent movie studios and backdrops featured in American cinema from Casablanca to ET. It’s a paradox typical of society today: right next door, yet somehow still a world away. But amidst all of that, a new light glows across the region’s forty-four cities and communities—from Burbank and Glendale to Hidden Hills and Calabasas to San Fernando and Universal City—the new Church of Scientology Valley serves all corners of the basin. The Valley Church is a most expansive addition to Scientology’s expanding universe of Ideal Churches, now numbering 19 in the Western United States alone and 57 internationally. “Ideal” is the standard set by Scientology Founder L. Ron Hubbard so that every Church could be a perfect expression of the religion’s principles and practices. So it was, on Sunday, March 19 at 1p.m., 5,000 Scientologists gathered to witness the largest Ideal Church of Scientology in North America come to life. It was a ceremony befitting the size, scope and substance of the Valley’s new home itself, from a medley of classic film scores evoking the golden days of cinema, to the “V for Valley” anthem written and arranged especially for the occasion. The thousands in attendance rose to their feet in jubilant celebration and applauded each impassioned dignitary praising the Church’s greater social impact. For the Valley congregation, that impact extends from helping a migrant child bridge the gap in her schooling with Study Technology, to helping tens of thousands of local youth take a pledge to be drug-free. And so, this grand opening now gives the Valley’s humanitarian outreach a permanent platform. Bringing that commitment to light were representatives of the San Fernando Valley on hand to welcome the Church: Deputy Chief Robert Green of the Los Angeles Police Department, Valley Bureau; Deputy Chief, Trevor Richmond of the Los Angeles Fire Department, Valley Bureau; Ms. Nellie Barrientos, Los Angeles Education Program Director; and Bishop Franklin Harris, Executive Member of the Los Angeles County Clergy Council. Deputy Chief Green began by pointing to the need for lectures on drug education, domestic violence and gang awareness and how Valley Scientologists have been pivotal in creating such initiatives with Clergy Councils and Police Stations throughout the basin. The Los Angeles Fire Department has enjoyed a decades long partnership with the Scientology Volunteer Ministers in disaster preparedness and disaster response. They have collaborated with Hollywood and Valley fire stations in carrying out small-scale classes with local response volunteers and even exercises for large-scale disasters. The dignitaries on hand stressed the importance of the Valley Church as an invaluable community partner, one that can always be relied upon. To that end, Ms. Barrientos, illustrated the imprint that L. Ron Hubbard’s Study Technology has left on her work with migrant families. LA County has over 200,000 migrant kids and so in tandem with Valley Scientologists, she has helped implement study tools to give these children a second chance. The new Church provides visitors with an introduction to Dianetics and Scientology, beginning with the Public Information Center. Its displays, containing more than 500 films, present the beliefs and practices of the Scientology religion and the life and legacy of Founder L. Ron Hubbard. The Information Center also details the many humanitarian programs that Scientology supports. They include a worldwide human rights education initiative; a far-reaching drug education, prevention and rehabilitation program; a global network of literacy and learning centers, and the Scientology Volunteer Minister program, which has become the world’s largest independent relief force. The massive Chapel of the Valley’s new Church of Scientology seats more than 1,000 and provides for Scientology congregational gatherings that include Sunday Services, Weddings and Naming Ceremonies. It will also host community-wide events, open to members of all denominations. The facility further includes multiple seminar rooms and classrooms, and an entire wing dedicated to Scientology auditing (spiritual counseling). The Valley Church is the most recent in a period of explosive growth for the Scientology religion over the past 12 months. The National Church of Scientology for New Zealand in Auckland opened its doors in January of this year and more are on the way, with grand openings planned for cultural crossroads in North America, Europe, the United Kingdom and Africa.